St James' church in Preston Plucknett was most likely built around 1420 by John Stourton the younger (also known as Jenkyn) son of John Stourton the elder who he succeeded as Lord of the Manor. Indeed, no place of worship had existed in the area since the Monk's chapel in Preston Bermondsey had become ruinous some years before. 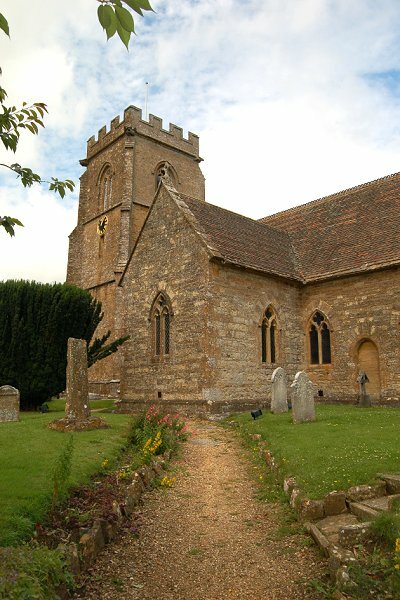 In 1877 C Pooley, in his Crosses of Somerset, recorded and illustrated the remains of a churchyard cross in the churchyard of St James, consisting of a socket with part of an octagonal shaft which he assigned to the early 15th century - making it all but contemporary with St James' church itself. The remains of the cross shaft survive today; the base remains in position a few metres from the South Transept, with the socket only 100mm above the soil, and somewhat worn. The shaft stands about 1.5 metres high. It is 325mm square at the base with the upper part octagonal, the chamfers are simply terminated. The cross shaft is now Grade II Listed. 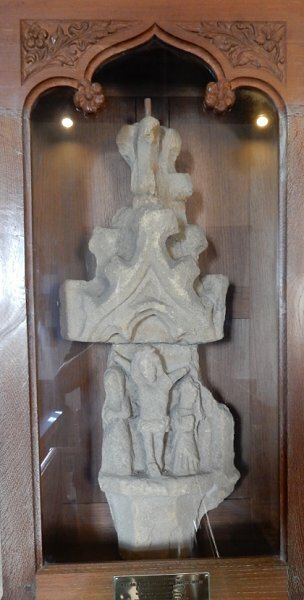 Subsequently the head of the cross itself was dug up in the churchyard and was originally displayed in the church belfry. It is now displayed in in an alcove (a blocked up former doorway) in the nave. The following description of the head of the cross is from Somerset & Dorset Notes & Queries of 1917. 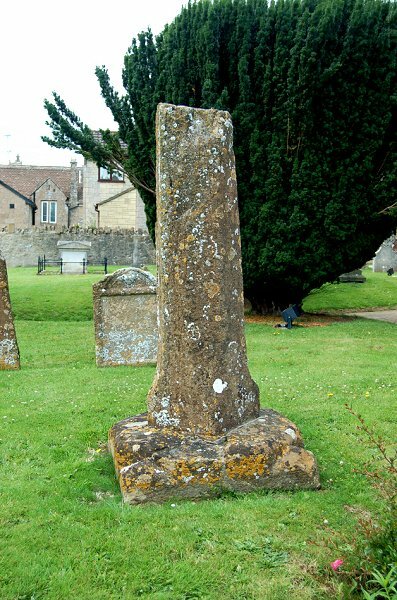 "The block of Hamhill stone consists of two parts, an abacus (the flat slab on top of a capital) and the head. This has two convex faces enclosed between buttresses set diagonally; a portion of one still remains. On one face in a wonderful state of preservation is a representation of the Crucifixion. The central figure, naked except for a loin cloth, has the legs crossed and the arms minus the hands stretched out on either side, the head with long hair declines to the right. The cross itself does not appear in the carving. The figures on either side face outward and away from the central figure. That of the Virgin with hands clasped in front is attired in a veil and long garment down to the feet; that of St John shows the left hand raised to support his head, while the right holds a book in front; the cloak is drawn away to the left showing underneath the pleated folds of a lower garment. The back of the stone is quite bare of carving but so carefully worked as to show that it was meant to be seen. The top and one side of the head are destroyed. The total height is 16½ inches (42cm) , breadth 12 inches (31cm), thickness in centre 7 inches (18cm), diameter at the abacus at lowest point 5½ inches (14cm). This has been broken off as there is no sign of a dowel. It might have rested on top of the shaft in the churchyard." St James, seen from the southeast approach path. The remains of the cross shaft are seen left of the path. Photographed in 2008. The remains of the churchyard cross in the churchyard. Photographed in 2008. The head of the Preston Plucknett churchyard cross, photographed in 1917. The head of the 15th century stone churchyard cross, now housed in an alcove (a blocked up former doorway) in the nave. 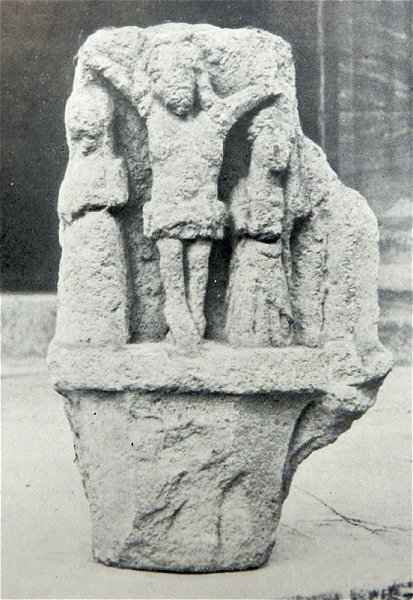 The carving depicts the crucifixion with Christ flanked by the Virgin Mary and St John. Photographed in 2015.